What happens after they’ve cut down every tree in sight? I was in the thick of traffic the other day driving somewhere and the traffic hadn’t moved for a few hours. Okay, it wasn’t a few hours, but it was close to half hour. As usual, people had jammed up the road by treating the two way road like a one-way road – this meant that the on-coming traffic now had absolutely nowhere to go. Earlier, they had cut down all the trees in the surrounding area – if you folks have been on St. John’s Road recently – you’ll see how mercilessly they’ve chopped down everything. I saw huge bulldozers one day and tree stumps lying all around the side of the road. The next day, everything was gone. This was one beautiful road – the stately old gulmohar trees providing the much needed shade by forming a canopy over you. What have they done now? Cut off all of them – more than 50 of them I think – to make the road the size of a football field. Did they ask anyone before they decided to take up their axe? Unfortunately, none of the other connecting roads are so wide so we are stuck with the same congestion problem – again. And it was proof that all the tree-chopping by the tree mafia hadn’t changed a thing. We were still stuck in one position for 1/2 hour now despite them making St John’s road the size of a football field. Wider roads within reason is fine but what is this mindless chopping without a second thought? Without any concern or approval from citizens (is this allowed? do we have any rights?!). How many more trees will they cut and how wide will they go? And what when they’ve finished cutting down everything in sight? What will they do after that? Have they figured out that one day, there won’t be anything left to cut and chop off? We really need people who are slightly smarter and think a little when on the road too. And that is going to be a challenge, always. Can you imagine a motorist pausing and thinking, “maybe I shouldn’t go that way and block all the incoming traffic”. Road sense I am afraid, especially when in times when most needed, goes away with the wind (perhaps it was never there to begin with). We need more traffic cops out there sorting out traffic problems. Where do these people disappear when you need them? We need more ways to get from one place to another! We need a whole new underground train system that will take off half off the motorists and vehicles off the roads. I think we need a lot more than mindless tree-chopping and I am afraid that by the time this city finds out, it’s going to be too late. It is already too late. 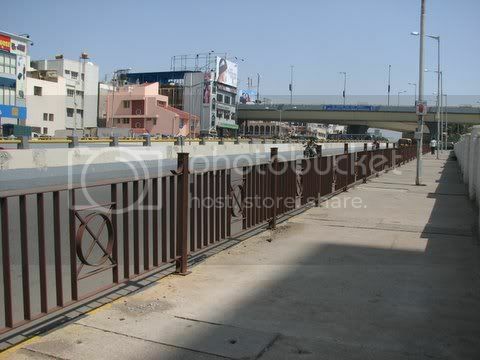 It took me 2 hours to reach from Koramangala to Silk Board, a distance of about 3-4 kms. Do join the initiative if you can…. The car-free week is already on and will culminate in a cycling meet on April 27th.